A bowl of steaming hot chili on a cold January evening? Ummm! Chili ranks right up there with other winter-warming foods. It’s a satisfying dish and easy to make. It also freezes and reheats well, so making a double batch is a good idea. And it’s not just for supper. Big game day, here we come! Chili recipes take all kinds of twists and turns; there are as many variations as there are cooks. Cincinnati Chili is in its own world of cookery, and I might add, almost legendary competition. But really, it’s all about personal taste. My Cincinnati Chili is a potpourri of flavors that I prefer, ideas from cookbook and web recipes, and from a cover feature in Cincinnati Magazine that my Ohio cousin Annie was kind enough to send me. The 2009 article was about local restaurants and their iterations of the city’s famous dish. 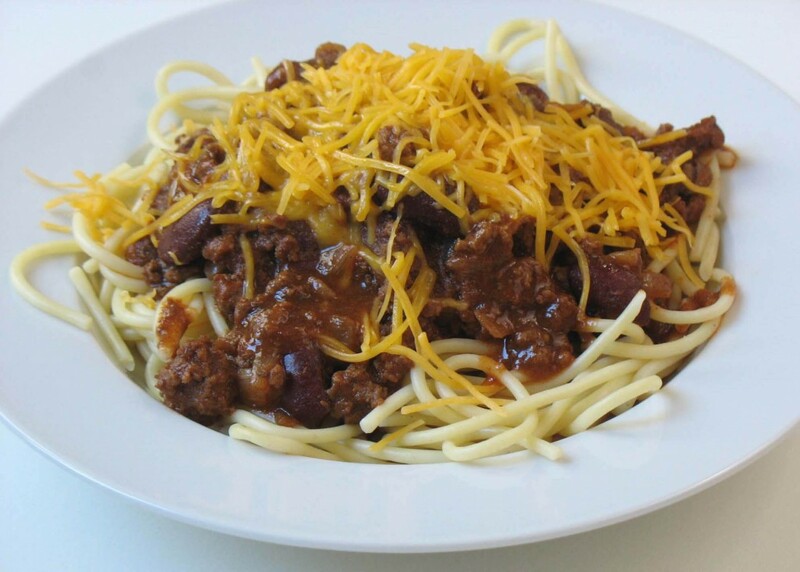 You can include cocoa or cinnamon etc, but importantly, Cinci chili is served with spaghetti. So, get cookin’! And let me know what you think by leaving a comment at the end of the recipe, right under the three little photos. After you’ve typed your comment, be sure to click on Notify me of follow-up comments so you will receive my reply via email. In a small bowl, stir together chili powder, brown sugar, cocoa, cumin, salt and cinnamon. Set aside. In a 6 to 8-quart pot, cook spaghetti as package directs. Drain and rinse with hot water; keep warm. In the same pot, brown meat with onion. Stir in seasonings and remaining ingredients except cheese (do not drain beans). Bring to a boil. Reduce heat to low; cover and simmer 20 minutes, stirring occasionally. Serve chili over spaghetti, topped with cheese. * Kitchen Note: My favorite all-around chili powder, Grandma’s brand, is no longer being sold (boohoo). So look for a mild ground chile combination that is more chiles and less everything else. McCormick has a ground ancho chile pepper that might fit the bill. Or try a Mexican market for different kinds of mild ground chiles—pasilla and ancho among them. I think this chili could be called 4-way chili because is has chili, beans, spaghetti and cheese. I think that’s how it’s defined — by the number of major ingredients. For me, it’s the addition of flavors like cinnamon and cocoa et al that make this a Cincinnati chili. Oh, and the spaghetti.